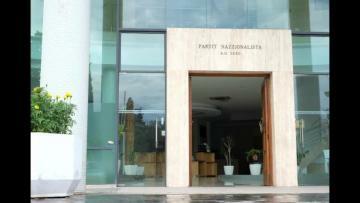 The PN headquarters in Pieta. Local committees and members of the Nationalist Party’s general council are being pressured by senior party officials close to the leadership to publicly declare, in writing, their loyalty to embattled leader Adrian Delia. Audio of a PN meeting in Rabat. The meetings are being physically monitored by persons close to Dr Delia, including loyal election candidates, who are attending these meetings to assure that all those present abide by the directive. 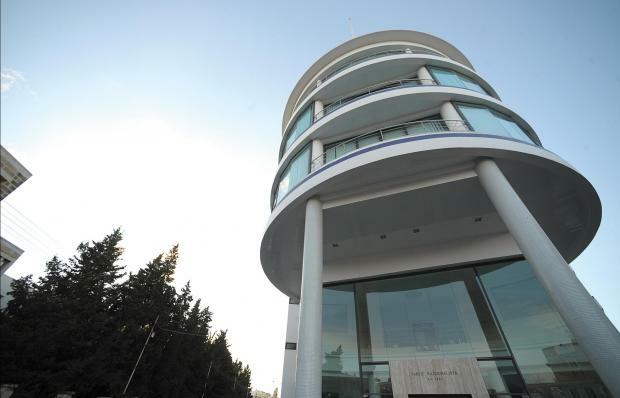 At the same time, party officials and members of staff at the PN headquarters are contacting all the members of the general council, asking them specifically whether they still agree that Dr Delia should continue leading the party. “It seems that Dr Delia’s restricted group at the PN headquarters are resisting all calls for him to step down and are trying to convince Adrian [Delia] that he still garners the respect of most of the PN councillors,” one councillor said. “They called and said they are doing a survey to sound out members whether Dr Delia should resign. Can you imagine what future I would have as a councillor if I tell them that he should go?” he said. Can you imagine what future I would have as a councillor if I tell them that he should go? Another councillor described the current situation at the PN as “chaotic”, saying he has never seen the party in such a bad state. “If Dr Delia’s clique wants to know what councillors think all they should do is call an urgent meeting of the general council and hold a secret ballot. It has become crystal clear in the past days that, even if all the allegations regarding Delia are false, he does not stand a chance of ever winning the PN an election. “That’s the only concern for me,” a veteran councillor said. During a meeting of one committee, in Rabat, one of the members said that even those who were not present should have their name put on the “loyalty motion” as “all party clubs are doing this”. Asked on Wednesday to state whether PN officials are exerting any pressure on committees to approve loyalty motions and calling councillors requesting their judgement on Dr Delia’s future, a spokesman for the PN did not reply by the time of writing. A message sent to the Sliema PN committee. Meanwhile, Dr Delia’s advisors called for a public show of force by organising a ‘reception’ for activists to be addressed by the leader at the PN headquarters on Thursday. Party sources said Dr Delia has already been told very clearly by senior officials to step down so that the PN can start picking up the pieces and try to get back to function. Read: Resignation by Adrian Delia? Then what? On Tuesday, administrative council president David Stellini and executive council president Mark Anthony Sammut held a long discussion with Dr Delia on the party's situation. So far, neither the administrative nor the executive council have been convened to discuss the recent developments. 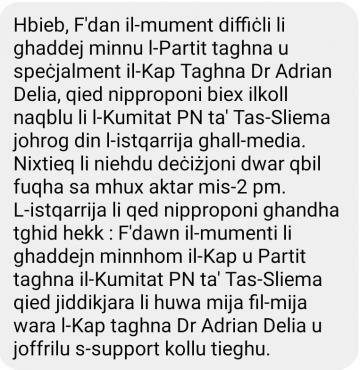 Meanwhile, the PN’s parliamentary group has also not been convened by Dr Delia amid increasing unconfirmed reports that the majority of MPs have lost trust in his leadership. According to the PN statute, 150 councillors can call an urgent meeting of the general council in which a no-confidence motion in the leader can be discussed and voted upon.